I bought this product completely as a spur of the moment decision. I was in Boots (I mean, that's hardly groundbreaking information is it?!) and I saw this on the clearance stand for £3.00. It was brand new, (obviously) and still had all of the outer plastic wrapping. Intrigued I asked a sales assistant why they had reduced it and she basically said that it was because they didn't sell NYX in that store and someone had accidentally ordered the wrong shade. Essentially it was too good of an opportunity to miss so I bought it. Oops. One thing I knew I wasn't sure about was the colour. It's a very dark pinkish brown that looks slightly gothic when applied to my lips. Now I don't have anything against that kind of look, in fact on other people I love it, but the real question is: could I pull it off? Well, to be honest I still haven't fully made up my mind yet. I tried this on for the first time with my everyday makeup at about 2pm and I think it came off as a little intense. However maybe in the evening time with a nice, heavy duty smoky eye the story would be completely different. In terms of formula it gets a serious thumbs up. I mean heart emojis all around with this little gem. 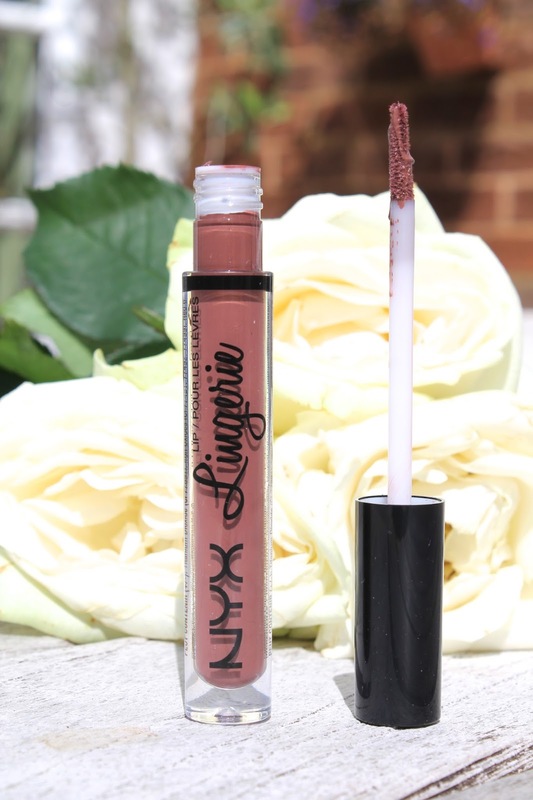 It's super creamy and almost melts onto your lips drying into matte perfection. Personally I'd probably pop a tiny bit of lip balm on underneath just to ensure your lips don't get dry throughout the day, but all in all no complaints there! HOW DOES IT COMPARE TO THE SOFT MATTE LIP CREAMS? I've tried three of the NYX soft matte lip creams and have adored two of the them. (If you want to read my full in depth review of Buenos Aires and Ibiza click here) And whilst I'm not entirely sure if they deserve the monumental hype that surrounds them, I really do get why so many people have gone cuckoo over these gems. Like the Lingerie Lipsticks they're inexpensive and fab quality, but which do I prefer? Personally I'm going to say the Lingerie Lipsticks. I have only tried one and I don't think the colour was the best for me, but in terms of quality of the packaging, formula and general finish I think I'd prefer to spend that extra pound on the Lingerie collection. All in all, I do think I would like to expand my collection, as for a drugstore liquid lipstick, they're pretty darn good! Do let me know if you've tried any of the Lingerie Lipsticks and if so, what did you think?! I've only tried the Soft Matte Lip Cream but I really love the look of the colours in the Liquid Lingerie collection! I saw another review say they were really really drying, would you agree?